Astro-Climate-Connection: Further Evidence That the Orbital Periods of the Planets Determine the Timing for Solar Maxima and Minima. Further Evidence That the Orbital Periods of the Planets Determine the Timing for Solar Maxima and Minima. Figure 2a shows the position angle of Jupiter measured from the alignment axis of the superior conjunction of Venus and Earth plotted against the position angle of Jupiter measured from the alignment axis of the inferior conjunction of Venus and Earth. 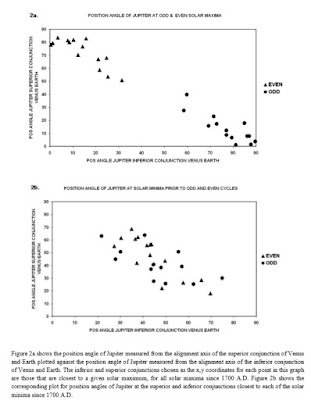 The inferior and superior conjunctions chosen as the x,y coordinates for each point in this graph are those that are closest to a given solar maximum, for all solar maxima since 1700 A.D. The dates of solar maxima that are used are those published by Usoskin and Mursala (2003). Figure 2b shows the corresponding plot for position angles of Jupiter at the superior and inferior conjunctions closest to each of the solar minima since 1700 A.D. Again, the dates of solar minima are those published by Usoskin and Mursala (2003). In both figure 2a and figure 2b, symbols have been used to segregate the points into the 14 even and 14 odd numbered solar sunspot cycles. 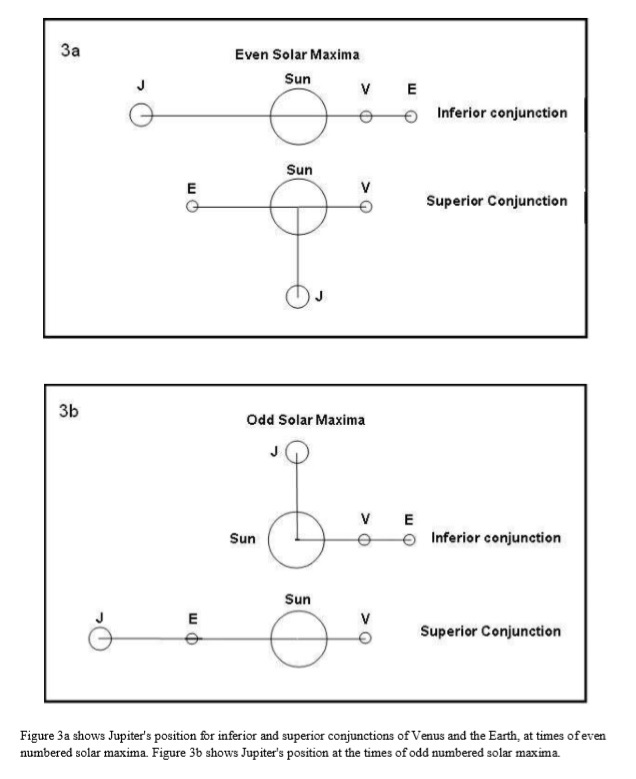 A comparison between figure 2a and 2b shows that there is a marked segregation between the position angles of Jupiter at solar maximum compared to solar minimum. When Venus and the Earth are at inferior conjunction, at a given solar maximum, the position angle of Jupiter either lies between 60O and 90O or 0O and 30O, and when Venus and the Earth are at superior conjunction, for the same solar maximum, the position angle of Jupiter is the complement of that angle. This is in marked contrast with the situation at solar minimum when the position angles of Jupiter lie almost exclusively between 30O and 60O for both inferior and superior conjunctions of Venus and the Earth. 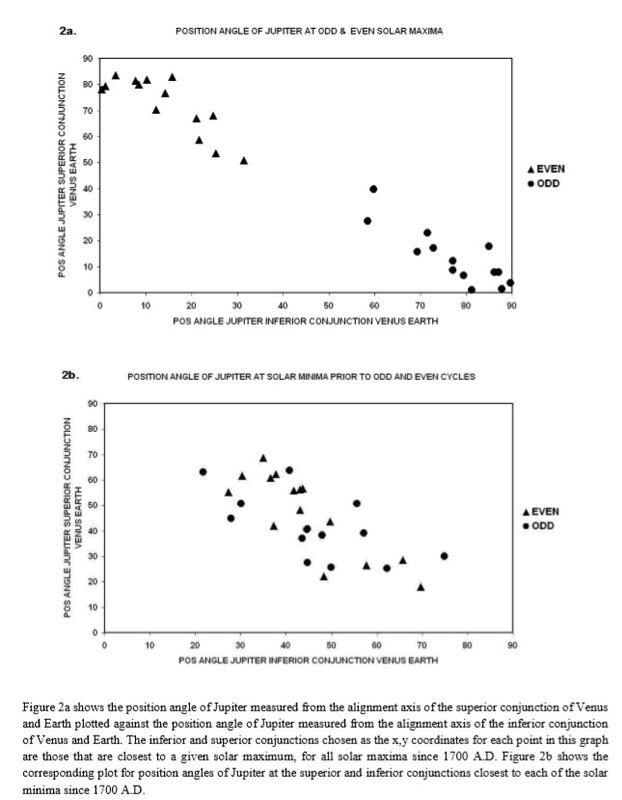 What is even more remarkable, however, is the complete separation between the odd and even cycles at solar maximum that can be seen in figure 2a. This means that Jupiter's position angle, at the time of alignments of Venus, Earth and the Sun, are completely different for even solar maxima than they are for odd solar maxima. 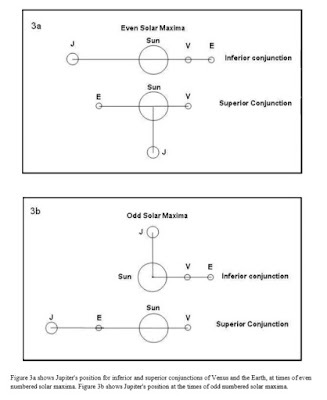 Figure 3a shows Jupiter's position for inferior and superior conjunctions of Venus and the Earth, at times of even numbered solar maxima, while figure 3b shows Jupiter's position at the times of odd numbered solar maxima. This is really cool! It makes one think about there being two attractors corresponding to odd and even solar maxima with the path between them resulting in a minima. You did not join the dots in time sequence. Does doing that show in fact that there is an orbital motion around an attractor defined as planetary angles? Are they strange attractors? Ian, this is very compelling and excellent work. A few years ago when trying to model the sunspot cycle, I was able to produce the skewed Gaussian look and the saw tooth pattern of the cycle with two interlaced continuously damped harmonic oscillators. One for the even cycles and one for the odd. There was no strong justification for assuming that form but now maybe there is. The graphic of that model appears in Tallbloke talkshop in the article lead. Both damped oscillators used your tidal torque frequencies but different parameters. It was interesting but at the time there was not much physical basis for it. The world is probably still more complicated than two damped oscillators but you continue to pull back the curtain. Congrats!